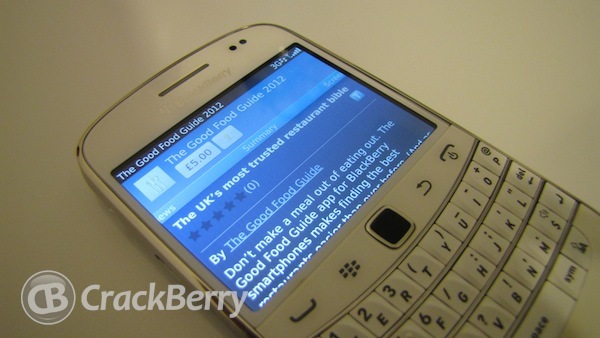 The Good Food Guide’s brand new app for BlackBerry smartphones has launched, making decisions about dining easier than ever. Don’t make a meal out of eating out – by downloading the UK’s bestselling restaurant bible to your BlackBerry device, you will never be stuck for delectable brunch, lunch or dinner options again. From quaint cafés to high-end dining, search the app in a way that works for you to find the cuisine you are after, in the location you need, and at a price that suits you. And knowing that the 1,300 restaurants featured met the exacting standards of The Good Food Guide, you can rest assured that your dining experience will be of the highest standard. Once you’ve found your ideal foodie venue you can chat about it via BBM, share and book your favourite restaurant and update your status to show where you are eating. After you’ve devoured your dinner simply add it to your favourites to remember it for next time, and even contribute directly to The Good Food Guide by sending in your thoughts and reviews about where you’ve eaten. Rochelle Venables, Managing Editor of The Good Food Guide, commented: "The Good Food Guide’s new app for BlackBerry smartphones is the perfect way to access all our fantastic restaurant reviews from the palm of your hand. Perfect for those wanting first-rate dining options on the move and great for showing off your culinary credentials by chatting with other foodie friends via BBM."